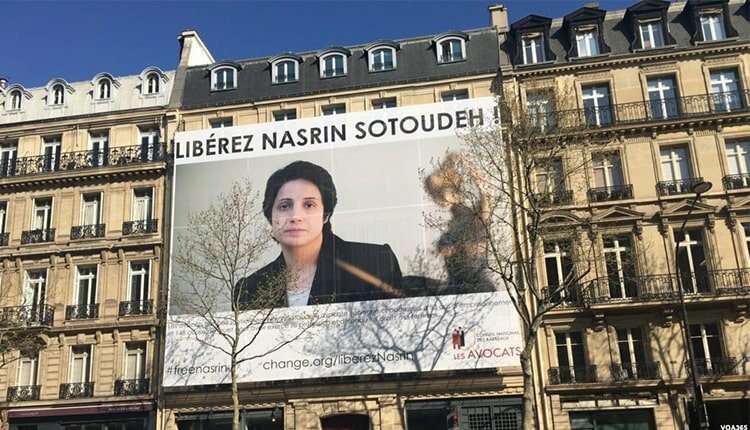 Human rights lawyer Nasrin Sotoudeh published an open letter on Saturday, March 30, 2019, on her official Facebook page in which she congratulated her fellow countrymen for the New Year. She also thanked everyone who supported her beyond her expectations. The main part of her letter is devoted to explaining the unfair verdict issued against her by Tehran’s Revolutionary Court condemning her to 38 years in jail. According to Ms. Sotoudeh, the majority of verdicts by the Revolutionary Courts are unfair and issued by breaking the principles of a fair trial. Greetings, Happy New Year, and my gratitude for all your support which has been beyond my expectations. I would like to hereby offer some explanations about the condemnation verdict issued by the Revolutionary Court against me. I would like to use this opportunity to point out that all the verdicts of the Revolutionary Court are issued under more or less similar circumstances, also to make it clear the extent to which the absence of lawyers in courts is detrimental to the accused, and to show how could one unravel the taboo of women not covering their hair. I have been sentenced to five years in jail upon a verdict issued in absentia in 2016 on the charge of association and collusion with the intent of sabotaging national security, by citing a sit-in outside the Justice Ministry’s Lawyers Guild. So, the verdicts issued against me amount to a total of 38.5 years plus 148 lashes of the whip. According to Article 134 of the Islamic Punishment Code, when there are multiple charges, the judge separately designates the punishment for each. At the time of implementation, however, the highest punishment is first implemented. In this dossier, the maximum punishment is 12 years which is implemented first. The fundamental question, however, is what happens to the rest of the punishments? First – The judge has considered my legal counsel regarding the girls of Enghelab Ave., also my placing a bouquet of flowers on a stand in Enghelab Ave. as examples of corruption and prostitution and issued a 12-year sentence for them. Second – Contrary to the principles of judgement, the judge has used an ugly term for the girls of Enghelab Ave. which could be prosecuted. Third – The court was convened without the presence of the accused or her lawyer. They openly prevented the lawyer from attending the legal procedure and this has been acknowledged in the indictment. Like many other cases, the principles of a fair trial have been ignored in this case. Of course, I do not wish to participate in any way in this game of injustice. Let the judges of the Revolutionary Courts play on their own. What is important, however, is that in almost all the cases undertaken by the Revolutionary Court, the verdicts are issued by violating the principles of a fair trial. I would like to use this opportunity and point out that this trend is so extensive and systematic that many of the accused are overlooked. A large number of political and civil activists and followers of other faiths confront the dangers of such unfair trials. In these trials, the lawyer is prevented from attending the trial; the court does not require security agencies to submit any reasons or documents; the accused is not given enough time for defense. This is the scene of the courts which issue several-decade-long sentences for people and now, many of them are lingering in prison for years under difficult circumstances. The day is not far, when the sun of justice will also shine on our homeland. Until that day, we continue to practice patience and peace. May we reach this goal.